In my first post, “Meet the Wealthy Sage”, I outlined my aim for this website, in the short term at least, is to share learning gained from my recent journey on the Internet to investigate ways of making money online and, in particular, to appraise folks about the pitfalls, threats and scams to be avoided when starting a business online. I’ve found it takes considerable time and effort to establish an online business and it’s most important to research thoroughly before committing significant funds to the endeavour. Also, there’s no guarantee of success, of course, and it’s extremely difficult to gauge how quickly income will start flowing, if at all, into a new business. In this second post, my objective is to inform readers about my progress to date and, in particular, to explain how I’ve been getting to grips with this online business thingy. For me, this post documents an important part of my journey. You’ll learn about some of the most popular ways of making money online, how to choose an appropriate business model to match your vision of what it is you want to do and also, as a beginner, what schemes you ought to avoid. You’ll also learn why it’s important to seek help in getting up the learning curve for business online and I’ll show you how to do this without need for significant expenditure. Firstly, there is no single answer to the ubiquitous question of “how to make money online?” There are many ways, of course, just as in normal business, but the method you choose, and whether it’s successful or not, will depend on your individual circumstances, abilities and commitment, including how much time, effort and focus you apply to establish your business. What is clear, however, is that the Internet has revolutionised how we make money and there are many benefits for aspiring entrepreneurs to work online. Also, from a personal viewpoint, I recognise we’re in a new era as a result of the growth of new technologies to an extent I feel compelled to investigate and participate in this “new economy”. I feel this for my own benefit, now I have time to do so, but also for the sake of my family so I may preserve some nest egg. The Internet operates 24 hours per day, 7 days per week, 365 days per year. There’s no need to be location dependent anymore as conducting business online provides the small business owner flexibility to work from home, hotel room, or anywhere there is ability to connect a laptop to the Internet. The need for physical storefront, physical products and warehousing are eliminated. There is reduced need for employees as there are systems, tools and software resources that can be leveraged to perform many routine activities. There is improved cash flow arising as transactions are generally paid for ahead of products or services being delivered. In the next section, I’ll narrow these 8 different ways of making money online down by grouping them together in such a way as to generate what I see are the top 4 ways (or business models) for making money online. The top 4 ways for making money online were derived from a cost benefits analysis carried out on the 8 different ways of making money online using entry barrier criteria (both cost and expertise requirements) against the prospect of earnings that may be generated by each alternative. Affiliate Marketing, including Arbitrage Sales and Banner Advertising. Consultancy Services, including Training and Coaching. eCommerce Stores and Platforms, including Digital and Physical Products, and a wide range of related Services. Network Marketing and Multi Level Marketing (MLM) Schemes. These top 4 ways of making money online reflect a range of business models available to aspiring entrepreneurs setting up business online. The alternatives are presented in a 2×2 matrix diagram, shown and described below, together with an explanation of the respective types of businesses and rational used in choosing which one to pursue. The diagram proves helpful in drawing conclusions and choosing right business model to reflect my vision for online business. The selection of business model and rational used for choosing it is described in the next section. In this section, I’ll draw the evaluation of how to make money online to a close, provide rational for the findings reached and, most importantly, share the conclusion with you on right business model to match my vision for business online. This includes Arbitrage Sales and Banner Advertising, and is shaded GREEN. Here, the Cost of establishing and running an Affiliate Marketing business is LOW, while the Revenue earned per transaction is also LOW. As business builds up, opportunities to expand into Arbitrage Sales and Banner Ads arise with potential to increase revenues. This includes Training and Coaching, and is shaded YELLOW. Here, the Cost of establishing and running a Consultancy business is relatively LOW, while the Revenues generated by the Consultant are likely to be HIGH. It’s also clear that experience and track record are barriers to entry in this sector. This applies to Digital and Physical Products, including Services, and is shaded YELLOW. Here, the Cost of establishing and running an eCommerce business is HIGH, while Revenues generated are also HIGH. This sector is dominated by large businesses but opportunities are being seen increasingly for small business entrepreneurs to set up and operate eCommerce stores. This includes Multi Level Marketing (MLM) Schemes and the quadrant is shaded RED. Here, the Cost of participating in a Network Marketing or MLM business online is relatively HIGH, whilst the record on Revenues earned by individual marketers is very LOW, most marketers in fact are known to lose money invested. I’ll now discuss the conclusions gleaned from the above evaluation and explain the rationale on which I’ve made the selection. By a process of elimination, the choice of Business Model for my given niche of making money online dropped out rather quickly. QUADRANT I is the traditional Affiliate Marketing sector. Given that the target audience within the niche is for aspiring entrepreneurs with little or no experience in online business, I conclude the most favourable entry point is via Quadrant I. This is therefore shaded green in the Diagram. All other options tend to be considerably more expensive or require a level of experience and expertise by the entrepreneur before getting started. Quadrant I has also traditionally covered Arbitrage Sales but this has grown into an eCommerce activity and its description is therefore covered under Quadrant III. It’s also the case that Affiliate Marketing is a good training ground for all online business with low cost training readily available on the Internet, including the important step of setting up and running your own website. Although initial returns tend to be slow for Affiliate Marketing, and numerous transactions are necessary to produce a reasonable income, it’s possible to scale your business as you gain experience by migrating some of your time from Quadrant I into one or other of Quadrants II and III. In my case, my aim is to move into Quadrant II as quickly as possible. Quadrants II and III are shaded yellow in the Diagram. These are more expensive to get running but it’s also necessary to have knowledge and experience before contemplating these two business models. The main lesson I’ve learned from my journey online is that there’s little to gain trying to take shortcuts and, if you do, it’s likely to result in delays and unnecessary expenditure. There’s a basic learning curve to go through so, in my opinion, it’s better to start at the beginning, have lots of discipline and patience, and don’t try to go it alone. That is, it’s necessary to get support climbing the learning curve and I’ll cover how you can get benefit of an “earn as you learn” approach in the concluding section below. QUADRANT II is shaded yellow because Consultancy is not considered an entry level sector. Consultancy services include training and coaching, both require a high degree of knowledge and experience, and are not therefore an option for beginners. Earnings are also expected to be higher in this quadrant. Also, for the most part, Consultants are likely to have existing businesses selling their time and, as time is money, this sector is much more likely to hire professionals to manage their online presence and build out their websites, rather than do it for themselves. Quadrant II is not a direct match to our niche and can therefore be discounted at this stage other than to recognise there’s scope to scale in this direction, especially training and coaching, once basic knowledge and experience has been gained in Affiliate Marketing. QUADRANT III is a very wide sector covering eCommerce Stores and Platforms. I distinguish between these two insofar as there’s a growing number of eCommerce Stores operating on arbitrage principles as opposed to the huge eCommerce Platforms operated by big players, such as Amazon, AirBnB and eBay etc. 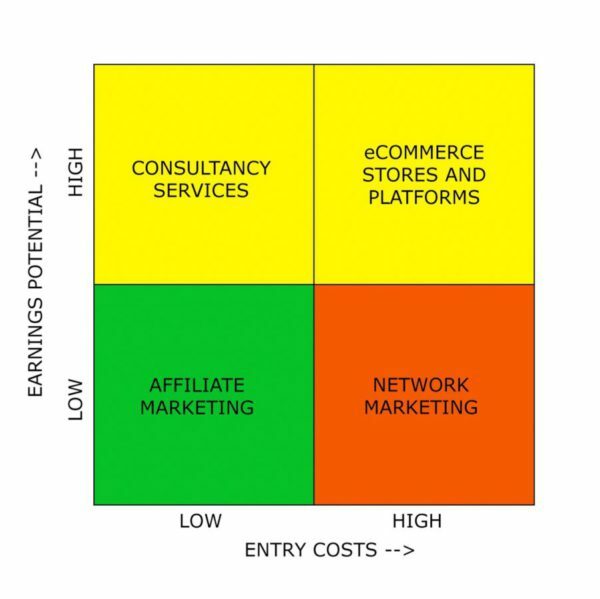 As the set-up costs for these systems are considered high and operations are more complex for rookie marketers, Quadrant III is also shaded yellow. However, the cost of setting up and operating arbitrage type eCommerce Stores has reduced sharply, so it’s attracting increasing attention in niches such as jewellery, T-shirts, and the like. We’ll cover arbitrage selling in another blog post at a later date. QUADRANT IV is the Network Marketing and Multi-level Marketing sector. It’s shaded red and I believe should be ruled out by rookie marketers on the basis of its extremely poor record of return for most marketers, including many who have paid large sums of money in membership fees to join these schemes on promises of high returns. This sector, also known as High Ticket Affiliate Marketing, has gained a lot of attention from the Federal Trade Commission in USA recently. It has questionable ethics at best and, at worst, some schemes and their affiliates, may be operating illegally depending on their country of jurisdiction. Quadrant IV is therefore shaded red to draw attention to the need for aspiring entrepreneurs to do their own research and, most importantly, to warn new entrants to online business of the large risks involved with Network Marketing. Given a clear choice of business model emerged from the evaluation above, I’ll now address questions relating to what Affiliate Marketing is about, the craft skills required, and where and how we should begin? Affiliate marketing is simply about promoting other people’s products and gaining commissions in event of any resulting sales. It’s a very simple business model that can best be explained using a well-known example, such as Amazon. Amazon has a website with a vast range of products for sale; you can promote any of those products and get a commission for each lead you send to Amazon that results in a sale. The key benefit of affiliate marketing is that it’s a great starting point for newbies owing to its simple operating model. All the rookie marketer has to do is promote. If you have no experience building a business or making money online, you probably have no idea what kind of product or service to offer on your website. The idea then is that you locate products for sale that belong to others and promote these as an affiliate. There’s no particular product expertise needed on your part, all you have to do is drive traffic to the product owners’ websites using your affiliate link. The sale is made on the owner’s website, the commercial transaction is handled there, goods are dispatched to the customer by the product owner, and the affiliate marketer then gets paid a commission for introducing the sale. Affiliate marketing is therefore a great way to start building your business and making money online. So what’s the craft involved, where and how should we start? Produce useful and meaningful Content that will add value to your Niche. It’s easy to see from the above 7 components that all centre around a Website. This is the key resource upon which the ultimate success of most online businesses are grounded. However, there’s debate among Gurus in the digital marketing arena whether there’s need for a website, or not, these days. This is centred around the growth of Social Media and Sales Funnel techniques. Time will tell how this discussion pans out but what can be said, however, is that the tried and tested website approach is comparatively inexpensive to the sales funnel approach, both in terms of set up charges and operating costs for generating traffic to the funnel. I’m therefore of the opinion it’s better to start with your own website and then scale up your business later to include the sales funnel approach to Affiliate Marketing. You can do this once you have accumulated the basic skills and knowledge, and there’s an earnings stream from your business to pay for it. Having said this, however, I’ll now share with you what I believe is the best and most cost effective means of getting help and guidance on how to build and grow your affiliate marketing business online using the website approach. Analysis has shown that the most appropriate entry point for making money online is via Affiliate Marketing. The 7 key elements of traditional affiliate marketing have been presented, which centre around the use of a website. The website, then, is the starting point and key resource upon which success of most online businesses are based. Setting up websites these days is not difficult and there are many specialised firms willing to do this for you. However simple as this may sound, be aware that there’s a process of customisation to go through to match the website to your individual needs. What I’ve learnt the hard way is that it’s much better to tackle the website build yourself with the help of a specialist learning platform to guide you through the build process and many other factors that you need to know for operating the website, including importance of good content and need to generate traffic. The journey I’ve been through is not considered something that budding entrepreneurs setting out on their journey to establish an online presence ought to try to do on their own. There are many supposed Gurus on the Internet seizing the space to market their products on the basis they are standalone, full training is provided, and done-for-you services cater for all your needs. Usually, only a partial picture is revealed and only after you purchase the product is the full picture known so you may determine its true value. You therefore have to be very careful to spend your money wisely on the Internet and you’re strongly advised to seek help and guidance along the way. Moreover, be aware that many of these Gurus can be a huge distraction, which leads to another massive threat that every novice internet marketer needs to be cautious about and why success to so many is elusive. It’s the “shiny object” syndrome; there’s so much out there that the rookie is tempted to jump around from one product to another, spend lots of money and time, and gain little to show for it. The end result is nothing gets achieved and many newbies give up as a result. It’s important not to make that mistake. It takes time and persistence to become an accomplished digital marketer and to get to point where you can consistently generate commissions and achieve success in what it is you’ve set out to do. You therefore need to remain focused and not to get too distracted by other opportunities until you see good earnings flow consistently into your business. Otherwise, the risk is real that you will run out of funds and in all likelihood end up in a much poorer situation than you started. In conclusion, my opinion of the best approach to avoid these problems is to get adequate, all round training in the first place. The most reputable and cost effective training platform I’ve come across for learning about affiliate marketing and how to create and operate your website is the Wealthy Affiliate. In my next blog post, I’ll issue a review of Wealthy Affiliate, including the full range of benefits that you can expect from this premier online training platform. Finally, readers are encouraged to engage with the blog articles. Please raise your comments, suggestions or questions in the comments section below and I’ll certainly respond as quickly as I can.